Charleston is one of the most popular cities to visit in the entire country and contains a number of interesting districts, historic neighborhoods and notable locations. 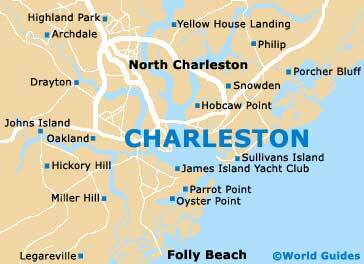 The city of Charleston consistently ranks as a top destination in tourist surveys. The combination of Southern hospitality and charm, laid-back coastal atmosphere, rich colonial history and the treasure trove of immaculately preserved houses and other architecturally significant buildings make this city a perennial favorite. From the historic houses, cultural attractions and churches of downtown Charleston and the Historic District to the unbeatable cuisine found at Mount Pleasant, you are bound to be charmed by the romanticism of the Old South. In the city there are three main districts of interest to the visitor. 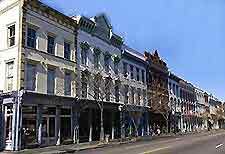 In the Downtown district you will find a generous number of interesting attractions, along with more than a few historic churches and landmarks, as well as excellent shopping opportunities. Many visitors to Charleston start their exploration of the city in this district, especially those on a tight schedule, as its diverse attractions that mix the old and the new mean you will always run into something interesting. For the religiously minded, there are plenty of unique churches to seek out in this popular neighborhood. The southern section of the city is also the oldest, almost entirely made up of beautifully preserved buildings of enormous historical and architectural interest. A trip to the city is incomplete without a stroll through this charming neighborhood, as the old houses are one of the city's major drawcards and what makes Charleston well-known across the country. Located just to the east of Charleston and founded in 1680, the Mount Pleasant district is one of the best places for eating out, whether it is breakfast, lunch, or dinner, as it is packed with great restaurants and cafés. Shem Creek is famous for its shrimp boats and delicious seafood. 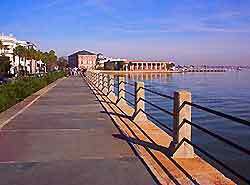 Also popular is a historic district called the Old Village, located along the riverfront within easy reach of central Charleston, which is a great place to wander around and take in the beautiful surroundings.